South Korea’s top 4 conglomerates would pay out record high dividend of 9.2 trillion won ($8.2 billion) to foreign investors for full 2018, data showed Sunday. 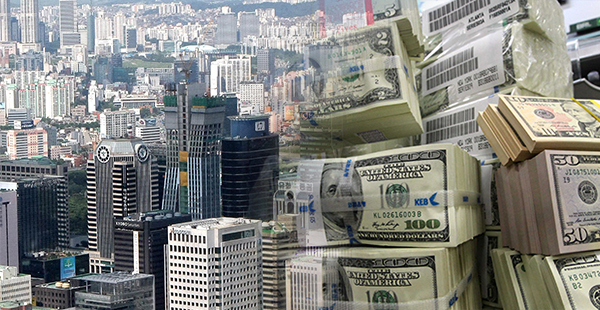 According to Seoul-based business tracker Chabul.com, foreign investors would collect 9.2 trillion won in dividends from the listed companies of Korea’s top 4 chaebol conglomerates – Samsung, Hyundai Motor, SK, and LG for fiscal 2018, up 43.0 percent from a year earlier. It would be the first time ever for the foreign dividend payout to exceed 9 trillion. The dividend payout for full 2018 was estimated by compiling quarterly and interim dividends paid out last year plus final dividend announced upon fiscal year closing. The total dividend payout of the top 4 conglomerates would be up 32.7 percent on year to reach a historic high of 17.98 trillion won in the same period. The share of the foreign dividends would rise to 51.1 percent in 2018 from 47.4 percent in 2017. Samsung Group would pay out the largest divided of 6.4 trillion won to foreign investors, which would be more than half of its total dividend of 11.7 trillion won. Foreign investors would receive 5.8 trillion won in dividend from Samsung Electronics Co. alone, up from 3.6 trillion won a year earlier. SK Group would come second with its payout to foreign investors reaching 1.2 trillion won, up 22.3 percent from the previous year. Its semiconductor unit SK Hynix Inc. would be responsible for nearly half or 527.1 billion won. Hyundai Motor Group would pay foreign investors 1.0 trillion won in dividends, up 0.8 percent on year, and LG Group 518.6 billion won, up 1.8 percent.